NETIA OFF CAMERA International Festival of Independent Cinema is one of the most important and, at the same time, youngest film festivals in Poland. It takes place annually in Krakow as a part of the Krakow Municipality’s cultural project called The Six Senses. 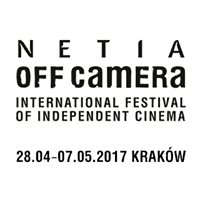 OFF PLUS CAMERA is one of the most distinctive film events in Eastern Europe, dedicated entirely to world independent cinema. The most important element of the festival program is the international competition, ‘Making Way’, which consists of 12 new first or second feature films, all competing for the Krakow Film Award of $100,000. The winning director is chosen by an international jury of acclaimed filmmakers cinema experts. In addition to the official selection of twelve films taking part in the competition, the OFF PLUS CAMERA program features some of the latest, critically acclaimed films from the festival circuit, many of them shown ahead of their Polish premieres. The OFF PLUS CAMERA program also includes separate national series, theme sections such as ‘From the Gut’ (showcasing American independent films), as well as retrospectives of distinguished filmmakers and “Catching Up”, a section devoted to movies from the past ten years that failed to receive Polish distribution. OFF PLUS CAMERA is a celebration of original, imaginative filmmaking at its best. It is also designed to spark discussion and encourage sharing of ideas. To complement the independent status of most of the films shown at the festival, the vast majority of the screenings are held in small-to-medium venues. The idea behind this decision was to pay tribute to the small movie theaters and so-called film discussion clubs which were the home of art-house cinema during the oppressive years of Communism. In the 1970s, 1980s, and 1990s these venues functioned as meeting places for the Polish film buffs and intellectuals alike. The Festival also features a variety of lectures, meetings with artists, discussion panels and musical events.